Arterial catheterization (the radial artery being the most common site) is often performed in critically ill patients for hemodynamic monitoring and serial blood gas sampling, and is a core skill for critical care and emergency providers alike. 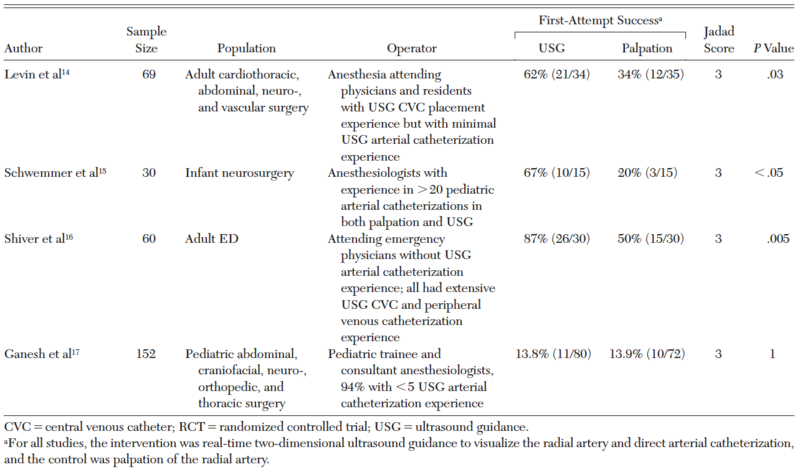 While ultrasound guidance has become standard of care for central venous catheterization, this is still not common practice for radial artery catheterization. In this critically ill patient population, there are often patient specific factors that make this procedure difficult using the palpation method, including hypotension, edema and obesity. Frequently, the palpation method requires multiple attempts which can result in arterial vasospasm, making further attempts even more difficult. This review article investigates whether their is a role for the addition of ultrasound guidance to radial artery catheterization. Does ultrasound guidance for radial artery catheterization improve first attempt success compared to the palpation method? 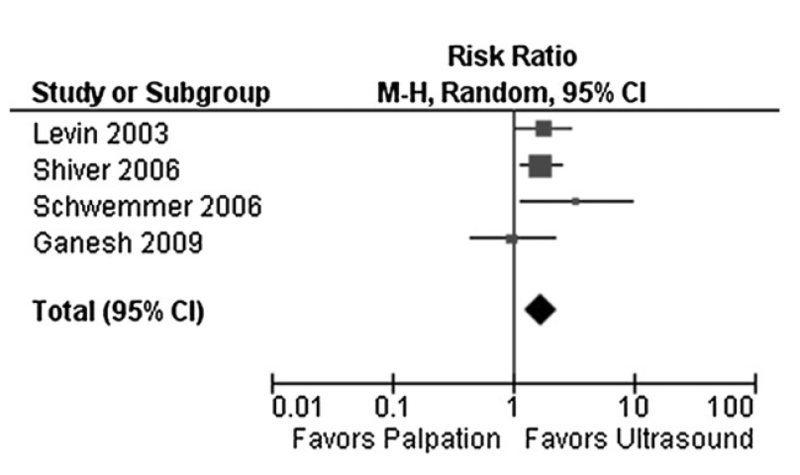 A total of 4 RCTs were included in the final meta-analysis. Individual characteristics can be viewed in figure 2. The pooled relative risk for ultrasound guided techniques was 1.71 (95% CI, 1.25-2.32). The forest plot can be seen in figure 3 with data provided in figure 4. 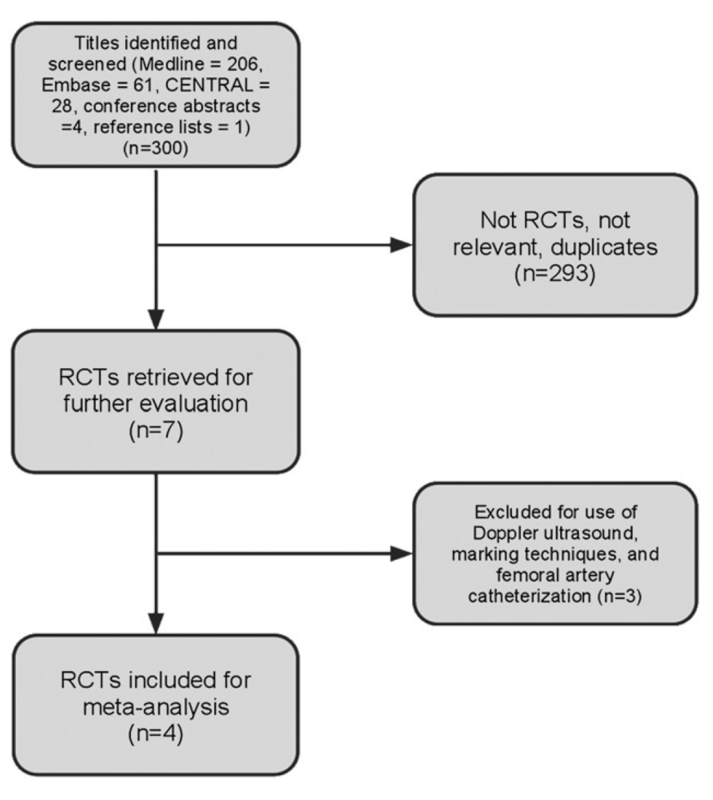 "Our meta-analysis clearly demonstrated a 71% increase in the likelihood of first-attempt success when using ultrasound guidance for radial artery catheterization." Radial artery catheterization is fraught with error and barriers to success. Often this procedure will be performed in sick patients, with the operator encountering obesity, edema, and shock, all of which can contribute to difficulty palpating the radial pulse. Furthermore, even if the pulse is palpated, this can be unreliable at predicting underlying anatomy. Ultrasound allows direct visualization of the radial artery, including depth, diameter and surrounding structures, and allows for ongoing needle guidance. While not studied, in my personal experience I have also noted numerous occasions where the only sign of successful radial artery catheterization was direct visualization of the catheter tip in the radial artery (i.e. no blood seen in flash chamber) on ultrasound. If the standard palpation method was used, this would lead to a failed attempt. It has become clear in many other instances that ultrasound adds safety and success to procedures routinely performed in the emergency department including: central venous access, thoracentesis, paracentesis, peripheral nerve blocks and arthrocentesis (of specific joints). This study allows us to confidently add radial artery catheterization to the list. While the patient population and operators in the study discussed are heterogeneous, it is reasonable to assume that emergency medicine providers who have experience with ultrasound guided procedures, will perform just as well, if not better than the study findings. This generalization assumes ultrasound guided procedure experience and those without this experience may not show a benefit over the traditional palpation method for radial artery catheterization. This study does not mean that the palpation method is obsolete, rather, it suggests that ultrasound is a useful adjunct and likely adds success in patients with risk factors for difficult radial artery catheterization such as obesity, hypotension, edema or a difficult to palpate pulse. Ultrasound guidance for radial artery catheterization shows a higher first-attempt success rate compared to the standard palpation method and should be considered by operators with other procedural ultrasound guidance experience.